Why ambient? A math teaching style that’s whole and all encompassing, with themes that repeat many times through the years, is most likely to be effective and successful. Oh no, yesterday’s post was so much fun, I find myself having trouble getting back to the Common Core. I’m hearing that it can be crafted into dynamic and interesting lessons, and I’m trying! But it does take a lot of effort to do that, and I can only imagine that adding the “testing” factor ratchets it all up to high stress levels, especially with the high-stakes nature of the tests for all concerned: children, teachers, and schools. Anyway, I’m taking another day off to breathe before diving into deep Common Core waters again. Knitting is learned by all Waldorf first graders. If they had experience with finger knitting, helping with simple sewing, and other engaging crafts in the Kindergarten, they will be somewhat more prepared to take on knitting. They can start simply, with just a six inch square. After making their own knitting needles with sharpened dowels, a bead at the end and beeswax polish, they’re ready to learn. I will devote a post to knitting, including a verse and detailed instructions, at the end of the Grade 1 section. 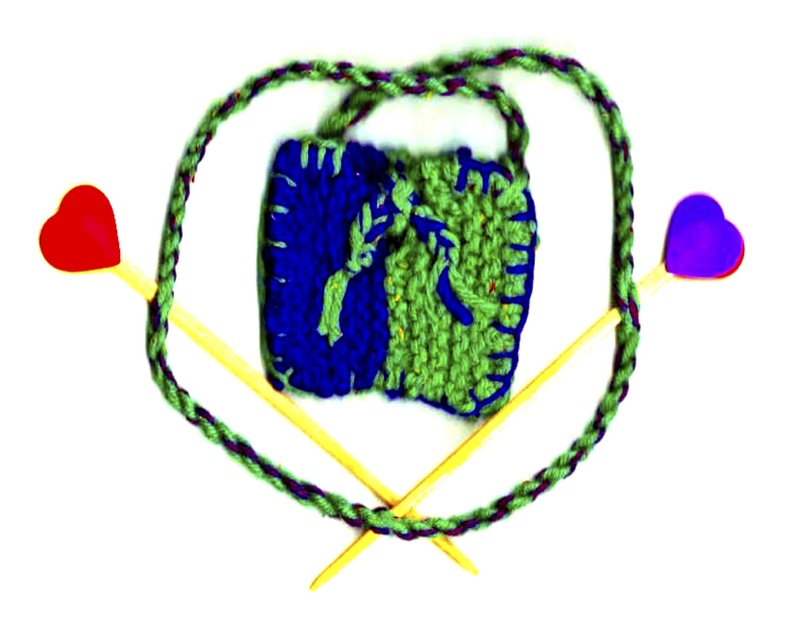 And just for fun, here’s a project that you can knit with your child(ren)’s help, as an inspiring motivator, before they themselves learn how to knit (see the image at the bottom of this post). Knowledge, remember, ensues in an environment dedicated to imaginative, creative knowing, where student and teacher alike surrender to the ensuing of that knowledge as a worthy goal. We will go back to the CCSS ELA Standards tomorrow! 1) Sharpen the chopsticks or dowels in a pencil sharpener. 2) Sand them with fine sandpaper to blunt the points a bit. 3) Apply an emollient (like shea butter or beeswax) and rub it in well. 4) Attach beads, clay, or foam “stickies” as stoppers (use a few drops of glue as well to secure them). 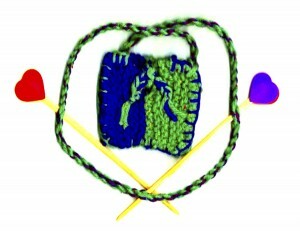 Make the coin pouch by knitting two rectangles as shown, in contrasting colors. Join the pieces in the middle with a running “V” stitch, leaving a small opening toward the top in front. 1) Cut 3 pieces of yarn 3 times longer than the length you need the finished rope to be. 2) With a partner, hold both ends and keep the yarn very taut while twisting in opposite directions. If alone, tape one end to a surface and twist in one direction. 3) When it’s twisted so tightly that it begins curling up on itself, carefully fold the twisted strand in half and let go, while smoothing the two strands together. Tie the open ends. Rope! Finish the edges with a blanket stitch using contrasting yarn on each side, leaving a couple inches open on top. 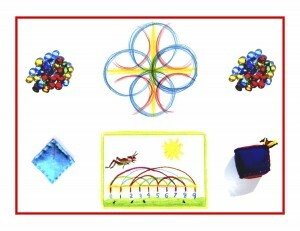 Kitting is a wonderful right-left brain integration activity and helps with many skills that are useful for math as well. Crafts and math are an excellent match, so do generously add crafts and hands-on activities to your math lessons!